Excellent evil nail biter with impressive Fred MacMurray stepping way out of character! One of the best film-noirs. Great dialogue. Walter Neff isn't a believable character. Film Noir at its finest. Touches on the darkest of emotions. Straight down the line. Edward G. Robinson plays an amazing and memorable part in this fantastic movie. A superb noir classic, Billy Wilder in top form! Great acting plus an interesting plot with lots of twists and turns. A classic film noir! Love it! 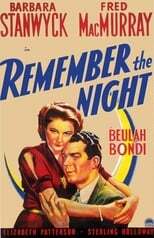 My first really memorable film noir. Barbara Stanwyck was great. An awesome film made even more awesome by a supporting role played by Edward G. Robinson.